Pēc izlasīšanas beidzot visi tie cipari un vēlamie ciparu lielumi ir krietni skaidrāki un vedot auto uz savirzi ir skaidrs ko aizrādīt tehniķim pie aparātiem varbūt kāds grib iztulkot? Alignment is one of the most important things in getting your drift car to handlecorrectly and a subject that is mangled quite a bit on internet forums. It is importantto make your alignment adjustable. In the case of you having a popular car like aNissan S chassis you can get adjustable front tension rods, rear toe, traction andcamber links all off the shelf from companies like SPL Parts and Battle Version. 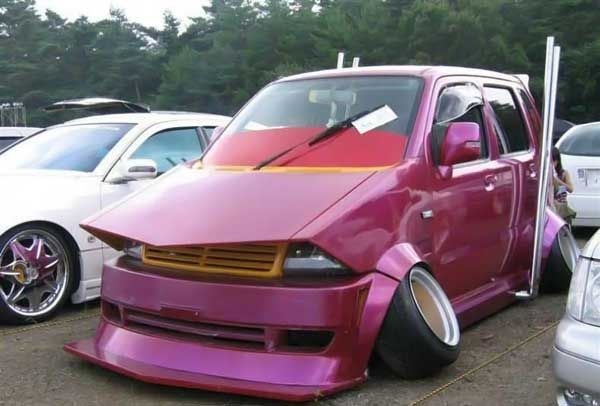 If youhave a car with MacPherson struts in the front, you can often get camber plates. GroundControl Suspension has camber plates for many different cars. Costa Gialamas uses Smart Strings to set up Matt Powers' S14.Smart Strings are one of the best things to happen since sliced bread. They allowprecise alignments to be done in the field quickly.If you have a car without much aftermarket support, Ingalls Engineering, KMac andSPC all make adjustable alignment parts so you can make non adjustable thingsadjustable for most cars. As a warning, stay away from camber bolts, they use a smalldiameter bolt with a cam on it and have a tendency to stretch and slip on cars that aredriven hard. One way to make the camber adjustable on MacPherson strut cars cheaply isto drill out one of the spindle bolts slightly. Then you can tilt the spindle inwardwhile tightening up the bolts. Surprisingly this will not slip as long as you tightenthe stock bolts fully. 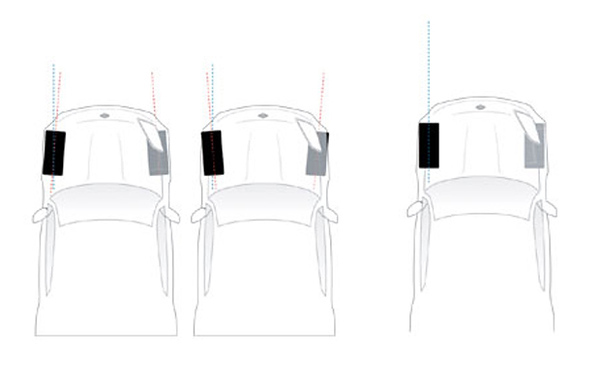 This can get you a couple of degrees of adjustment.Once you make your car adjustable you can try these basic alignment settings. Theseare settings that are good for drifting and are not necessarily good for everydaystreet driving. Rapid tire wear on the street may occur. 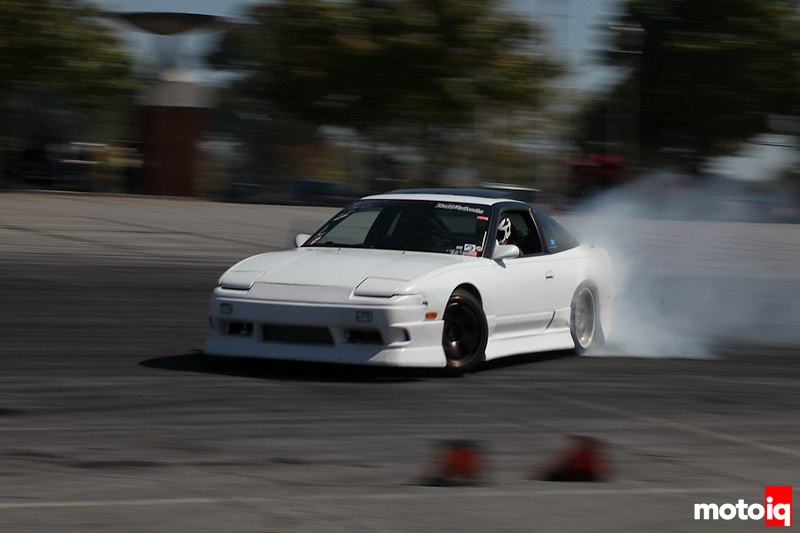 However you will probably getbetter tire wear when drifting! Mike Kojima uses a Smart camber gauge to set the camber on DaiYoshihara's Falken Tire S13. 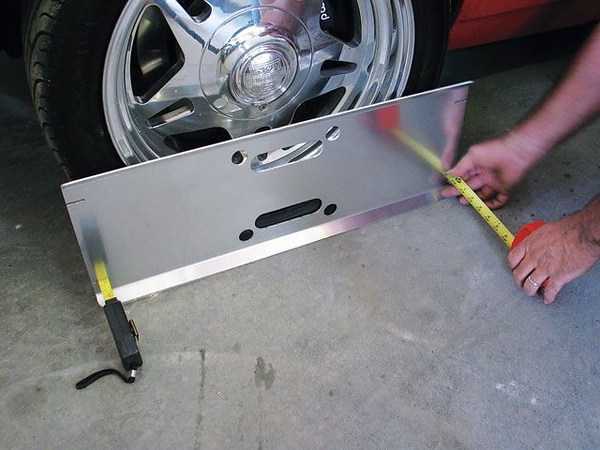 The smart camber gauge is one of the best ways toset camber in the shop or in the field. It can also be used to setcaster. 3-4 degrees negative camber helps put the tread flat on the ground when under sideload. Under load, the tire's carcass wants to flex and lift the inside of the tread offthe ground. Also as the car rolls, it wants to tip the tire to where the inside of thetread is being lifted off the ground. The car&acirc;&euro;&trade;s suspension geometrytries to make up for some of this but it cannot totally compensate. Running negativecamber compensates for this. By keeping the tread on the ground you get better frontgrip and less understeer. You don&acirc;&euro;&trade;t want your drift car toundersteer if you can help it. 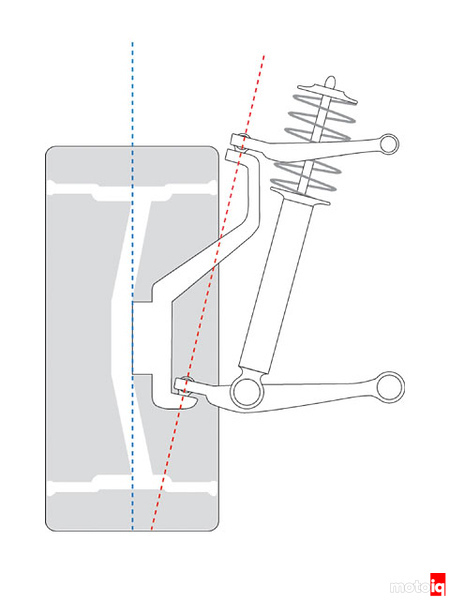 If your car has multilink front suspension, you can usecloser to 3 degrees of negative camber, strut type suspension can use closer to 4degrees. Don&acirc;&euro;&trade;t run crazy amounts of negative camber, like demoncamber hellaflush style, it&acirc;&euro;&trade;s going to hamper your front grip. From the left, Toe-In, Toe-Out, Zero Toe. For drifting you wantto run a slight amount of toe out in most cases, usually around 1/8" to 1/4" toeout. More than this will make the car twitchy and respond oddly to steeringinput. Front Toe out helps the car turn in and initiatebetter. You want to run a slight amount of toe out, typically about 1/8&acirc;&euro; totaltoe out. A little toe out will help your car initiate better by turning in sharper.This makes a big difference when you are trying to feint. Too much toe out makes thecar twitchy so I don&acirc;&euro;&trade;t recommend more than&Acirc;&frac14;&acirc;&euro; toe out. You can set the toe really accurately with smart strings bymeasuring the front to rear of the wheel's rim in reference to the string. Youhave to make sure the wheels are not bent first. Longacre toe plates are useful for a quick toe set in the field.They do not reference off of a datum plane like smart strings so if the caritself is not perfectly straight or the toe is off on both sides of the car, youmight mess up the thrust angle. Plates are really fast so they can be used if youneed adjustment fast like in a 5 minute call. 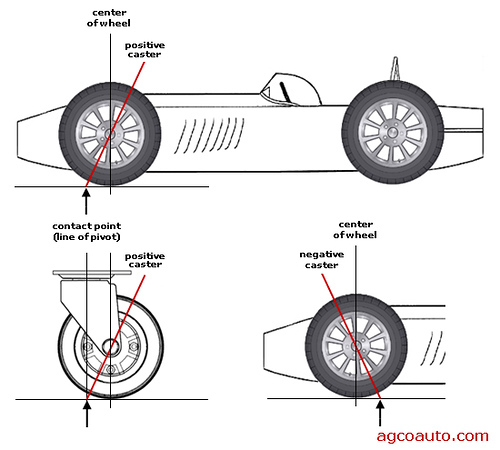 Caster is the angle of the steering axis when looking at the carsideways. You want to run as much positive caster as you can get without hitting the fenders.Typically this is around 7 degrees or so on most cars. Caster really helps a drift carby making it self-steer better. When you start to drift, you can simply let go of thewheel and let if feed through your fingers and the car will counter faster than if youwere steering it yourself. Caster also gives you more negative camber as the wheelturns which helps front grip. More caster helps the car turn in better and makes thecar more stable as well. You probably don&acirc;&euro;&trade;t want to exceed 9 degreesof positive caster as this can actually cause understeer due to weight jacking as wellas contribute to bump steer. Positive and negative caster explained. No modern car runsnegative caster. 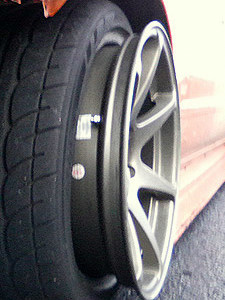 This picture shows how positive caster increases negative camberas the wheel is turned, this is a good thing! You don&acirc;&euro;&trade;t want to run tons of wheel offset to look hella flush.This increases the scrub radius too much and hampers steering precision and can causeundersteer and poor turn in when done to the extreme. Don&acirc;&euro;&trade;t run somuch offset that your scrub radius gets to be more than 3&acirc;&euro;. Sodon&acirc;&euro;&trade;t go crazy with lip and wheel spacers. At 3&acirc;&euro; ofscrub you can still run a pretty nice and deep wheel but don&acirc;&euro;&trade;t goextreme to get the hellaflush look, like running a narrow wheel on a widebody car with4&acirc;&euro; of spacers! Too much offset to the outside increases the scrub radius asshown here. This causes wheel fight and makes the car turn in worse and makes itharder to initiate. A bunch of offset to make your car look good will make ithard to drive. This picture show what all of the sins of current trends will doto you. A super offset stretched wheel causes the tire to debead under side load.This car handles like crap too. You cannot easily adjust the alignment of a rear solid beam axle car like an AE86. A good chassis shop can bend the beam so you can get a little negative camber and toe in if you desire that. 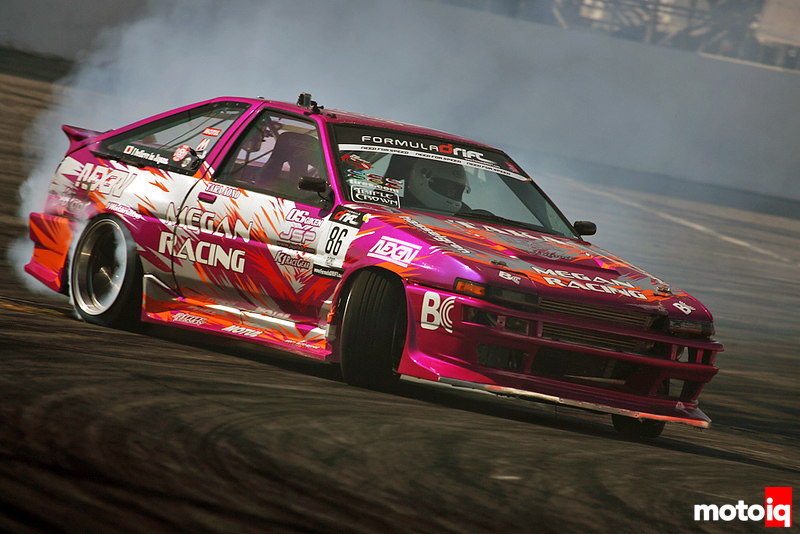 A beam axle car like an AE86 isn’t adjustable so you can’t go much further with one of those but rear alignment is critical in getting a drift car to handle well and drift easily. 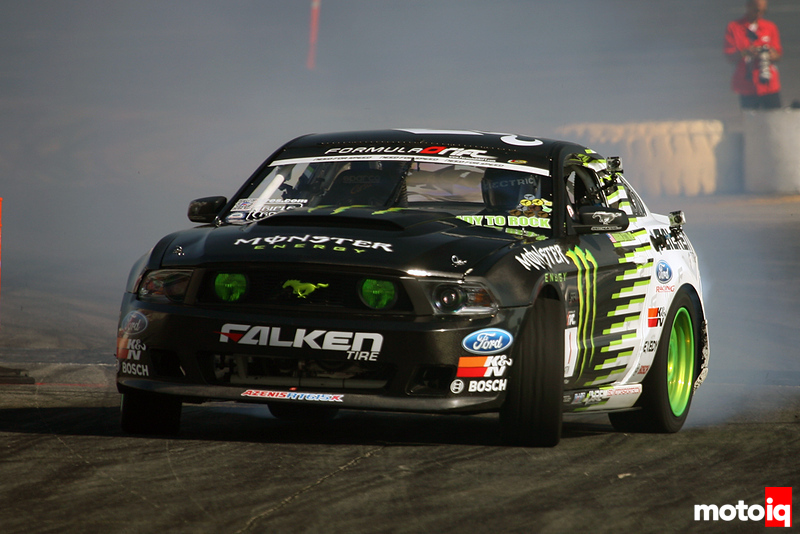 Vaughn Gittin Jr's Mustang has a very sophisticated beam axle modified with CV joints in the hubs so his rear alignment is totally adjustable. It's really cool and really expensive! On a drift car you want to run the rear camber as close to zero as possible. This will usually give you the best tire wear, and best forward bite. If you want a little more side grip you can run some negative camber but usually no more than one degree negative should be run. Toe is being adjusted and measured at the same time to speed things up. This is a subject that has a lot of misconceptions as many people try to tune how the car is balanced in drift by adjusting the rear toe. You should not run too much rear toe in on a drift car. In doing this you will have a car that will straighten up if the throttle is lifted or modulated. This is the leading cause of serious drift car crashes. 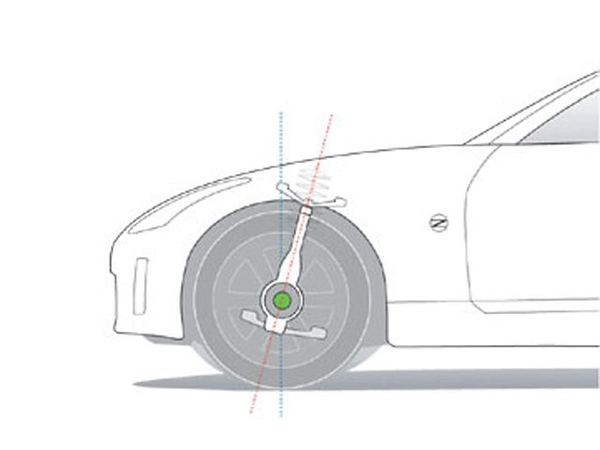 A car's understeer oversteer balance should always be adjusted in the suspension, not by using the toe. If you want the car looser with more oversteer, increase the rear bar stiffness and or rear spring rate and stiffen the rear shock. If you want to tighten up the car with less oversteer, run softer rear bar, spring and shock. 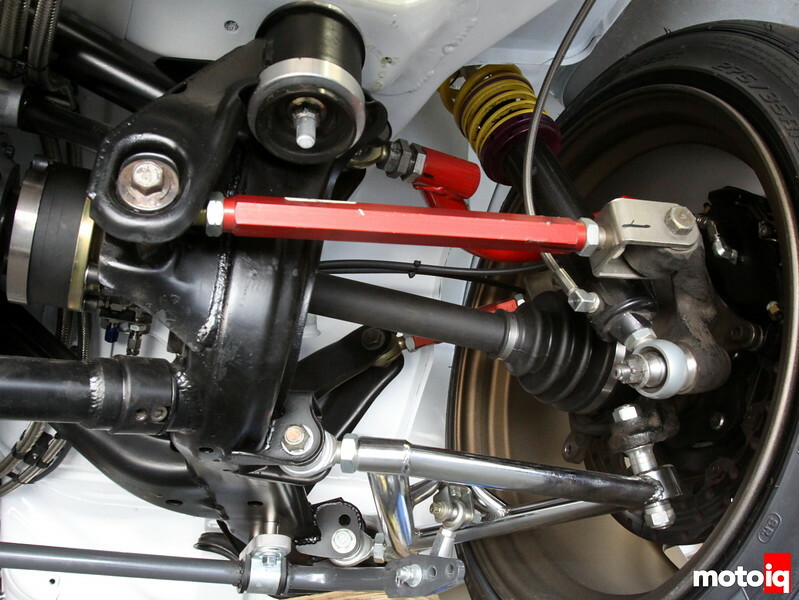 Using a lot of toe in to "add more rear grip" is a bad idea and a common mistake made by many drift suspension experts. It is not adding more rear grip, just rear steer and makes the car a lot more twitchy and hard to drive. The car will spin easier and tend to straighten out and shoot straight into walls and stuff with too much toe. To get more rear grip, you must play with the springs, bars, shocks and tire pressure. A little rear toe in helps the car's slide stability. You want to run a little toe in. Usually you want to run about 1/8” toe in with most cars. 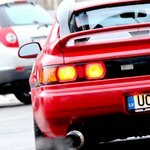 Cars with semi trailing arm rear suspensions like BMW E30’s, Nissan Z31’s and S12’s can run a little more like ¼” toe in as these cars will toe out under roll. If you are having trouble making angle in high speed turns you can run zero rear toe but never run rear toe out, that will make your car very twitchy. If your car is too loose and you don’t have suspension adjustment you can add more rear toe to help stabilize the car but it is not a good idea to exceed ¼” toe in. On a Nissan S chassis, shortening the traction rod increases toe in under roll and gives you more forward bite. Lengthening it has the opposite effect. The Nissan S Chassis traction rod is the forward most upper link. Making it shorter adds more rear toe under roll. Making it longer reduces rear toe under roll. This is better than adding static rear toe. Usually it is best to leave the traction rod about the same length as stock. These are the basics of drift car chassis set up, do this right and you will be ahead of the game and ahead of most other people. When you move up to Pro Am, are starting to do some serious tandem drifting or are getting into the pro levels, there are many other tricks can be apply but these require quite a bit more technical background to apply. We will cover these later. Remember have fun, don’t be afraid to experiment to find what is best for you and don’t practice on the street! ja braukaa ikdienaa tad toe-out gan labaak atstaat pa nuleem jo vinsh grauzh riepas. taisni braucot diezgan izteikti peld. Tik mazs toe out nevarētu izraisīt nekādus efektus. Ja ar peldēšanu tiek domāta sekošana ceļa risēm, tad to dara zemprofila riepas un cietas bukses, mazāks sakars ar savirzes parametriem. ja auto peld, kautkas nav kārtībā. ar savirzes parametriem viss ir kārtībā. kur tu viņu regulēji un ar kādiem aparātiem? iespējams palika kādas skrūves vaļā? ja būtu traki šķība savirze, skanētu riepas skaļi. braucot pa taisnu es varu arii stuuri laist valjaa nebaidoties ka vareetu kkur aiziet un nav arii taa ka buutu visu laiku ar stuuri jaapiestuuree. nav iisti taa ka braucot aatri paliktu neomuliigi seedeet iekshaa. sajuuta taada kaa truuktu sakjere un peldeetu riepaas. pagriezhot stuuri /saliekot skjeersaam pa sakjeres truukumu nevar suudzeeties. taa doma vairaak bij taada ka ja jaabraukaa lieli gabali tad tas kriit uz nerviema vairaak kaa seedinaata/cieta/zema mashiina.